Follow legendary Route 66 and see how Americans traveled from the 1920s through the 1960s. 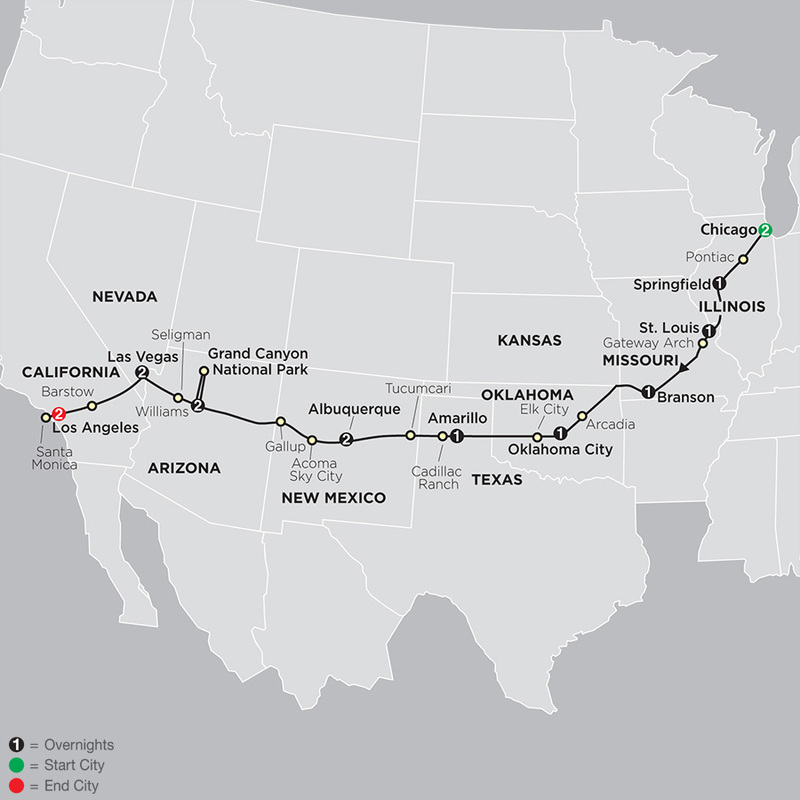 This historic route begins in Chicago, travels through eight states, and ends in Los Angeles. On this Route 66 tour, you’ll get the opportunity to travel to some of the cities along Route 66, visit many of the Route 66 museums, and step back in time to when the journey was part of the fun. Visit Pontiac’s Route 66 Hall of Fame & Museum, which features memorabilia from the heyday of Route 66. In Oklahoma, visit Pops, a landmark building selling gas, sodas, shakes, and diner food. At the National Route 66 Museum in Elk City, antique cars and historic documents help you feel what it was like to travel Route 66. 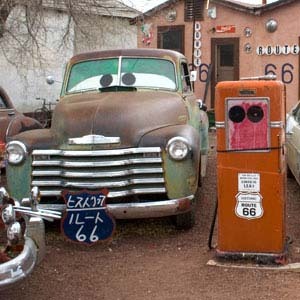 In New Mexico, visit Russell’s Car Museum, featuring classic cars and memorabilia. Overnight in Williams Arizona-listed in the National Register for Historic Places and where you’ll see neon signs of the intact circa 1940s "Motel Row." Before arriving at the end of Route 66 in Santa Monica, California, visit the Barstow Route 66 Museum, which houses a collection of historic artifacts and photographs related to Route 66 and the Mojave Desert communities. This tour also deviates from Route 66, so you can see breathtaking scenery at the Grand Canyon and experience the excitement of Las Vegas. In Springfield, visit the Abraham Lincoln Presidential Museum, and in St. Louis, witness amazing views of the city and the Mississippi River from the top of the 630-foot-tall Gateway Arch. These are just some of the many highlights of this Route 66 tour designed for value-minded travelers. Sit back, relax, and let Cosmos handle the driving and details while you enjoy! Orientation tour of the famous Las Vegas "Strip"